Even men with a poor prognosis may want to consider fertility preservation. Men may later regret not considering fertility issues prior to starting cancer treatment. Figure adapted from Brannigan RE. Cancer Treat Res. 2007;138:28-49. Based on your treatment plan, your risk of infertility is [high, moderate, low] (see table on reverse). Although it may not be on your mind now, it is important to discuss fertility before you begin treatment. 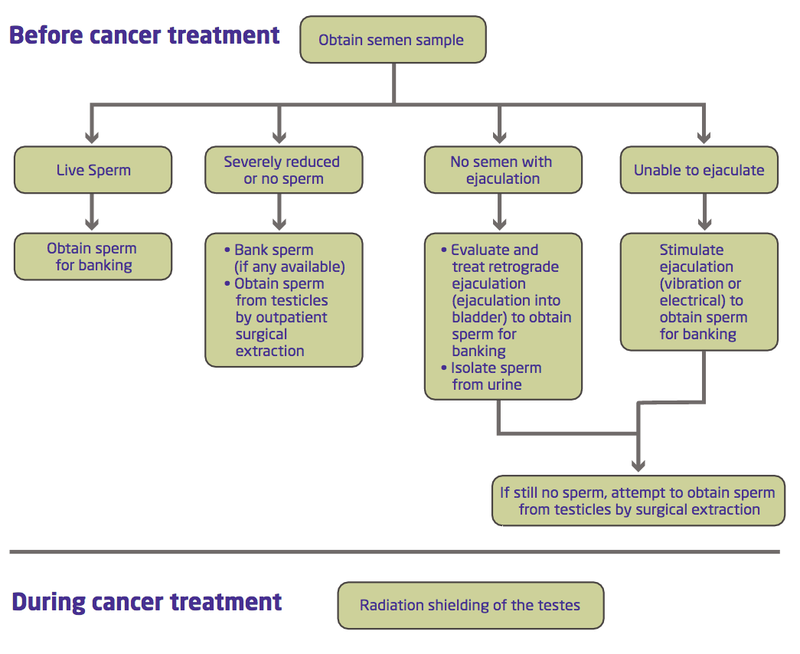 You may have options for fertility preservation before you begin cancer treatment (see figure to right). The American Society of Clinical Oncology and the American Society for Reproductive Medicine recommend, when possible, at-risk patients be referred to a fertility preservation specialist prior to starting cancer treatment. There are standard options for men diagnosed with cancer who wish to preserve their fertility. These options are illustrated in the figure below. Individual chemotherapeutic agents and multi-agent regimens are associated with varying degrees of infertility risk. Table adapted from LIVESTRONG; and Brannigan RE. Cancer Treat Res. 2007;138:28-49. Brannigan RE. Risk of infertility in male survivors of childhood cancer. Lancet Oncol. 2014; 15(11): 1181-2. Osterberg EC, Ramasamy R, Masson P, Brannigan RE. Current practices in fertility preservation in male cancer patients. Urol Ann. 2014; 6(1): 13-17. Tschudin S, Bitzer J. Psychological aspects of fertility preservation in men and women affected by cancer and other life-threatening diseases. Hum Reprod Update. 2009;15:587- 597.